While the Soviet T-34 tank was the best tank in the world at the time of its introduction, it suffered from some severe operational drawbacks. Most critical were the fact that the turret was cramped and made conditions for observing the battlefield difficult. Also, the turret design was complex and required machining to prepare it for assembly. 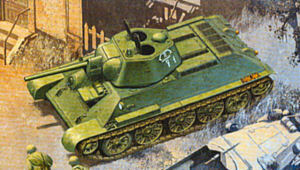 Since they could not carry out massive redesign of the tank at the time – late 1941 – the Soviets instead designed a roomier turret better suited for casting which would fit the standard 1420mm turret race of the Model 1941 tanks. The new turret was rationally laid out to give the highest amount of protection to the frontal 60 degree arc of the tank, and used a simple modified hexagonal shape to achieve this. The new turret, quickly dubbed the “Gayka” (hex nut), went into production in early 1942. Another major change in the tank was to switch from rubber tired pressed or cast steel wheels to internally buffered steel wheels which use a similar operating concept to those on the KV series tanks. But this was quickly found to be too fatiguing for T-34 crews, and therefore starting in April 1942 the first and last road wheel stations were fitted with cast steel wheels with rubber tires. This tank remained in full production until January 1944 when the T-34-85 series tanks began to enter production, but some factories continued to produce them for a few more months. Also, in 1943 a much-needed commander’s cupola was added to the design. DML has now answered the requests of many T-34 fans and released a Model 1942 series tank with the “Gayka” turret. The kit also adds the cast wheels and an extra set of the rubber tired cast wheels, so the modeler has his choice of early or standard 1942 production tanks. The tank also comes with the seven-bolt rear plate and seven-bolt exhaust shrouds as well. The turret is the generic T-34 cast turret which was produced by several of the factories, but this one appears closest to that from Uralmashzavod. It has the rolled and smoothed lower casting joint (referred to by modelers as “soft edge”) and the small bolted plate between the two hatches on the roof. While a number of variations exist, the lead factory – Factory No. 183 in Nizhniy Tagil – got full authority to standardize all components and by 1944 had managed to get most of the factories using the same molds and casting methods to create cast turrets (Chelyabinsk used pressed steel for theirs which was unique until they stopped manufacturing T-34s in 1944.) I’ve never really been able to find out how many of the “Gayka” turreted tanks were built, but a good estimate would be about 16,000 and another 3,000 with the commander’s cupola. As noted many older but well-done parts are used in this kit. The late-model double bump stops on the lower hull molding are still present, as previously noted they can’t really be seen when the model is assembled and is a “so what” correction. The kit comes with three different stern plates but only the one on the “Gayka” turret sprue is probably best for this version. The turret sprue (L) includes a one-piece shell (thanks to “slide molding”) with even the holes for the mantlet bolts and mounting guides in place. The cast-in reinforcements under the turret are present as are some casting marks on the turret. When joining the turret top and bottom do not be too fastidious as the race section and top section were welded together after casting, and the weld bead could be pretty rough; also the cleanup of mold edging was done for speed and not finesse. The model comes with a standard PT periscopic sight/viewer with the “acorn” shaped cover found on most T-34s. The modeler has a choice of but one barrels for the F-34 gun: a one-piece item with hollow bore from “slide” molding and muzzle cap molded in place. A gun breech and partial interior to the turret are provided as with all of the DML T-34 kits. Three different finishing directions are provided: Unidentified Unit, Eastern Front 1943 (4BO green with lozenge 2 - 71 in white); Unidentified Unit, Southwestern Front, Middle Don 1943 (whitewash over 4BO green, Red 252); and “Moskovskiy Kolkhoznik” (Moscow Collective Farm Worker), Moscow Kolkhoz, Eastern Front 1943 (whitewash with name in red during presentation ceremonies). A targeted set of Cartograf decals are provided. Overall, this is a great improvement over the Italeri/Zvezda and Tamiya kits and should be quite popular, as well as herald the rest of the “Gayka” turreted 76mm tanks.